5/09/07— Acquisition — Edinburgh, National Gallery of Scotland — The National Gallery of Scotland has just acquired a Head of Christ by Paul Delaroche (ill. 1) which would seem to be a preliminary study for the décor of the church of La Madeleine in Paris. The painting is inscribed on the stretcher : « Tête d’Eugène Buttura, pour servir de modèle á une tête de Christ par Paul Delaroche » . Thus, the model is the landscape artist Eugène Buttura. It was frequent in the XIXth C. to ask friends or family members to pose for large compositions. Let us remember the case, for example, of Hippolyte Flandrin in his procession of saints for the church Saint-Vincent-de-Paul. Eugène-Ferdinand Buttura (1812-1852) was a student of Jean-Victor Bertin before learning to paint figures in Paul Delaroche’s workshop . There is an engraved portrait of Delaroche by Buttura, and another of Buttura by Delaroche (ill. 2). The unfinished project for La Madeleine by the master is today well-documented, in particular thanks to several painted studies that have resurfaced. 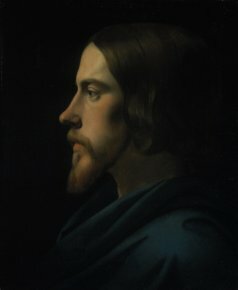 If the work acquired by Edinburgh was indeed intended for the décor, it was probably meant for the head of Christ in the Conversion of Mary Magdalene of which a preliminary study is in the Wallace Collection. It is, in fact, the only scene where Jesus’ attitude corresponds to such a profile. Should this be the case, it would date from about 1834, when Buttura was 22 which seems reasonable given the model’s appearance. Having obtained the Prix de Rome in 1837, he was also portrayed by Jean Murat during his stay in the Eternal City (Rome, Villa Medicis) . Although the grim face of this second portrait corresponds well enough to the one engraved by Delaroche (ill. 2), the resemblance to the painting acquired by the National Gallery of Scotland is not a close one even if it is always difficult to compare portraits, especially when one is a profile and the other full-face. The National Gallery of Scotland has distinguished itself over the last twenty years for the purchase of French historical paintings of the XIXth C., from Fabre to Guillaume Dubufe. 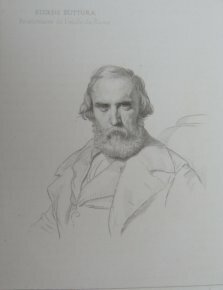 Delaroche often illustrated episodes from British history. This country, and particularly London institutions, returned the interest by collecting his works. He will now be present as well in the Scottish museum, Great-Britain’s number two art gallery. Paul Mantz, “Artistes contemporains. Eugène Buttura”, Gazette des Beaux-Ats, 1, VIII, 1863, p. 186-193. This painted portrait is reproduced in : Philippe Grunchec, Les concours des Prix de Rome, 1797-1863, Vol. II, Paris, 1989, p. 131.